What are your plans for Labor Day weekend 2019? Tom and I will be in Vegas for the Ultimate Weight Loss Live 3 day event. We are so excited about it because we had an amazing time at the last one we attended. I have a special coupon code to save you $100! If you have ever struggled with losing weight and keeping it off or want to improve your health through a whole food plant based lifestyle this event is for you. Look at the amazing lineup of speakers! This could be a life changing weekend as you join hundreds of like minded people who are on a similar journey. Enjoy a SOS free whole food plant based buffet with Tom and I for lunch on Saturday and Sunday. We will have a sign up for sitting at our table and you can ask us questions! This could be the boost you need to start or stay on your journey to good health and achieve your happy weight. It is an investment in your health as well as a fun weekend where you can make new friends. Bring your spouse and invite your friends to join you. Experience a weekend that can change your life! How to set yourself up for success, even if you’ve got a busy life! * LUNCH – Vegan lunch will be provided Saturday and Sunday. * DINNER – Potato Bar dinner will be provided Friday and Saturday. This video was recorded at the Ultimate Weight Loss Live Vegas event in 2017. 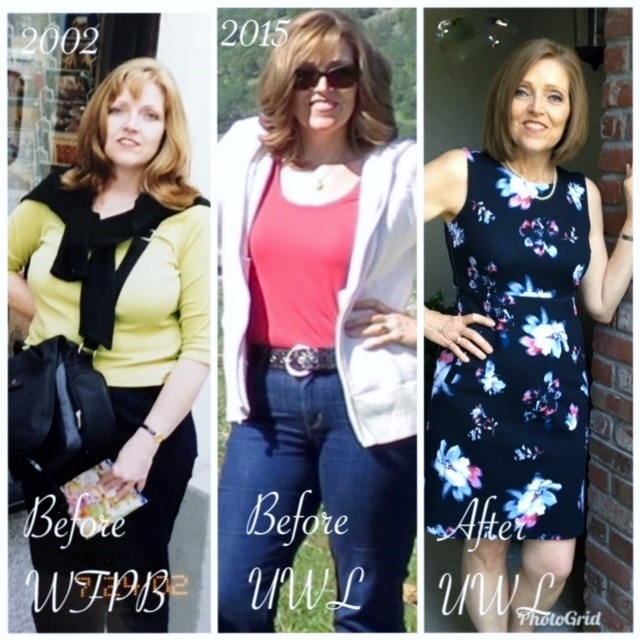 It tells a little bit about my history with yo-yo dieting and my success with the UWL program. I hope you can hear the enthusiasm and feel the energy I have from being at the conference surrounded by like minded individuals. 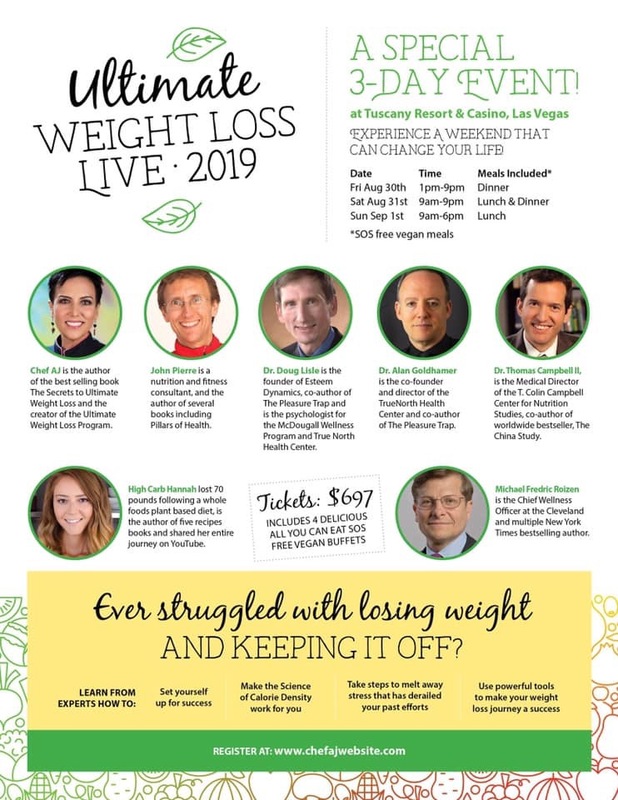 Please join Tom and I at the Ultimate Weight Loss Live 2019! On the left is me at my highest weight wearing a size 16. In the middle was when I joined Chef AJ’s Ultimate Weight Loss Program in 2015 wearing a 10/12. I had yo yo dieted for nearly 4 decades before learning how to eat to lose weight and keep it off. The photo on the right is me now wearing a size 4 petite! Thank you Chef AJ and John Pierre for all you have taught me in the UWL group! How To Use The Coupon Code nutmeg100 and Save $100. When you use our affiliate links you help support the work here on the blog and our YouTube channel without any extra cost to you. Thank you for your support. Be sure to check out our Amazon Affiliate Page where we showcase our favorite kitchen gadgets, small appliances, food, books, hiking gear and fun stuff for the grandchildren.